This Kaiser paper is one of my all time Fave collections. I find These new Aster flowers are such a dream to work with and they add a unique touch to any layout . They are so soft and dreamy with the touch of green really making them pop. THE Soft, pastel hues in the papers marry perfectly with the new pastel Aster flowers . I clustered the ivory cherry blossoms and ivory lillies with the soft pink Aster blooms and I feel the touch of green adds a brilliant splash of rich color. This was a beautiful memory as Ella Jai stayed over night at our place and the next morning we went out for breakfast and then on to the park for a play . Ella was in the perfect mood for photos and I managed to shoot 30 beautiful shots … this is one of my faves . Tim Holtz Rosette die cut, Making memories bling brad. Versa color ink/ Atlantic blue. 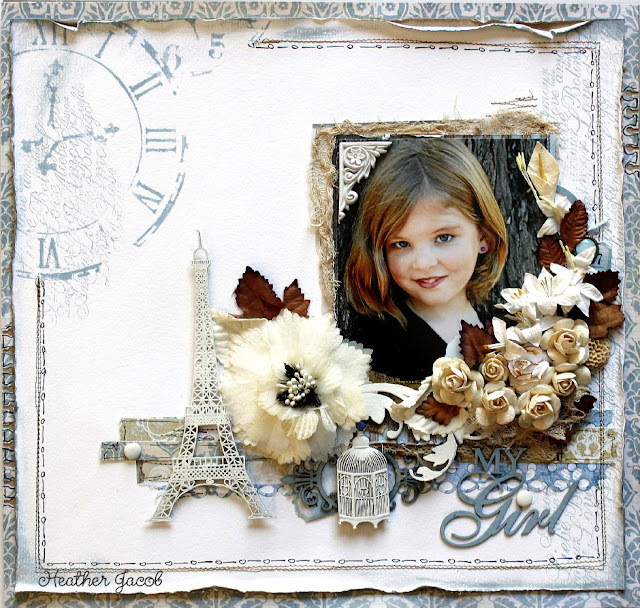 I wanted to create a romantic feel to this page blending in with this precious recycled post card . I chose this paper because of the neutral shades. I wanted to draw the eye to the photo therefore I clustered the blooms around the stacked heart s.
I pulled some of the roses apart and secured them separately to the page with brads . BASIC GREY PAPER, EK border punch , versa color ink/sage, white gesso , hero arts stamp/ circle dots, friendship . a glorious bunch of blooms bursting with texture and bold richness . a large ivory organza bloom as a feature. to use some of these delish blooms in your creations. Wow what beautiful LO's. I love those lillies in the first and the soft touches of pink. Three absolutely stunning layouts! - just so much to look at. Wow! Wow, all three lay-outs are absolutely breathtaking! I really love your style! Fabulous all of them but I think the top is my fav, such a lovely photo! She's so gorgeous and the LOs you made are stunning!! Amazing heather truly amazing!!! Your layouts are absolutely stunning!!! So dreamy and beautiful and wonderful, I just love all of the gorgeous details..and you use the GT goodies so well! Wow Heather what absolutely gorgeous pages for Green Tara! The flowers really are beautiful and I love the detailed stamens. Your pages show them off to perfection. Love them all but the first one is my favourite!! wow! you blow me away. your work is suimply stunning!!! These are sooooooooooo gorgeous Heather!! I love love love love all the flowers and loveeeeeeeeeee that birdcage on the first one!! oooo I just drooled all over these on the GT blog, guess what? I just drooled over them again here.. LOVE THEM!!! Oh Heather, just love the little things you do on your pages. Makes them so uniquely you. How do you do it? as always Heather your attention to detail is amazing! Wow!These are simply stunning! Love the beauty in each one! An absolutely lovely layout saw your blog on scrapology so just had to have a peak at your blog now you've got another follower. Wauw amazing work again cool layers and perfect details. I just adore the softness to the top two pages and the subtle hints of colour on the third. Gorgeous work Heather! These are all just amazing and I love the monochromatic look on your layouts. You are always so inspiring. Love everything you do Heather.